1. What gal doesn't love jewelry? I have a few pieces that are sentimental to me. The first is my Tiffany Double Loving Hearts Ring. Of course, there's a tale to tell. To make a long story short, Hubby played in a golf tournament one week after Middle was born (are you indignant for me???) A few days before the tournament, he had Eldest bestow upon me the trademark blue box with white ribbon. After I gleefully unwrapped it, Hubby's response was, "There. That's so I can play golf this weekend." So guess what postpartum, leaky boobed, raging hormonal me did? I sent that ring back to Tiffany sooooo fast (it didn't fit right anyways). And there was silence (from us, that is. Middle had colic and never stopped crying) and rage In the Trenches for weeks to come...until a new package from Tiffany arrived in the mail for me. With another Double Loving Hearts Ring that fit perfectly with a note from Hubby that said, "Please don't send this one back!" I haven't taken it off since. 2. More jewelry. 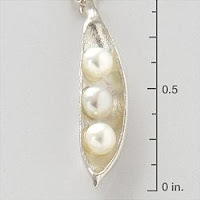 My peapod necklace was given to me by the boyz on Christmas 2005. It's from Red Envelope. Whenever I wear it, I get a lot of comments on how unique it is. 3. Now on to the practical mommy possessions. Call me a dork. I love my new front-load washer and dryer. I do laundry twice a week, about 3 loads each time: darks, whites, and the boyz' clothes. It has a kid wash cycle, people! I pre-treat NOTHING. Just throw it in--ketchup, dirt stains, blood and all....and everything comes out clean. (Hear the harps playing?) Heaven! 4. 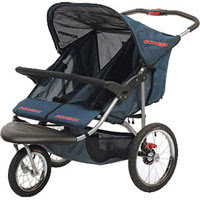 And last but not least, the ever crucial DOUBLE JOG STROLLER. This thing has been a lifesaver. Granted, it's big and bulky, but at the same time, it's roomy, it's comfortable, it collapses, and has been ideal for our vacations at the beach. The main criteria for buying a jog stroller has to be the front swivel wheel. Trust me. Don't buy one without this. A lot of stores (BabiesRUs, Target, etc.) don't sell jog strollers with the swivel wheel. I got this Schwinn online, as did 2 of my friends. We're corny like that. Kid wash cycle? No pretreating? I thought I loved my new front-load washer, too, but apparently I am STILL living in the Stone Age. I'm jealous! Great job sending back the ring, I so totally would have done the same thing. I am cracking up at the double-heart ring story! That is so Scott!and so you! I have looked at that RedEnvelope peapod nklace so many times--it is pretty! How much do those double jog strollers run and if your kids are 2.5yrs. apart, does it effect the balance? I think I am jealous of the washing machine too! Oh I love the jewelry! I WANT that Tiffany ring. I remember when my hubby was romantic like that. Makes me miss it! I covet your front loaders too. One day, in about a decade, when my current set wears out. We HAD to buy a new set but it was right when front loaders were coming out and so darn expensive. Sigh. Oh well, my clothes are clean with top loaders. great post. i too have the front load washer and dryers--love them. and i also bought the schwinn double stroller last year right before my husband and i took the kids across country to go on vacation to the beach. i researched all of them and this one was the one i wanted. the swivel wheel is essential--you have to be able to manuver with one hand and the swivel feature gives you that ability. so once again we think quite alike. i love anything tiffany.....way to go sending the ring back. i could write a book about the many "rules" my husband broke following the birth of my two babies. that is actually the worst part of coming home with baby.....the husband's comings and goings, social calendering, golfing, alone time, workouts, lunches with friends whenever, a smile and a nod on their way out the door without any kids....all the while your sitting in your pajamas, stuck at home, sleep deprived, exhausted from being up all night, desperately the one who needs to loose the weight and get back in shape...wondering how this happened to you. need i say any more? i'm off my soapbox now. have a great weekend. I am glad to hear that you own a jogger with a swivel front wheel also. I was given the impression that a locked front wheel was safer for the child, but I decided to take a risk anyway since the swivel wheel jogger was so much easier to maneuver.